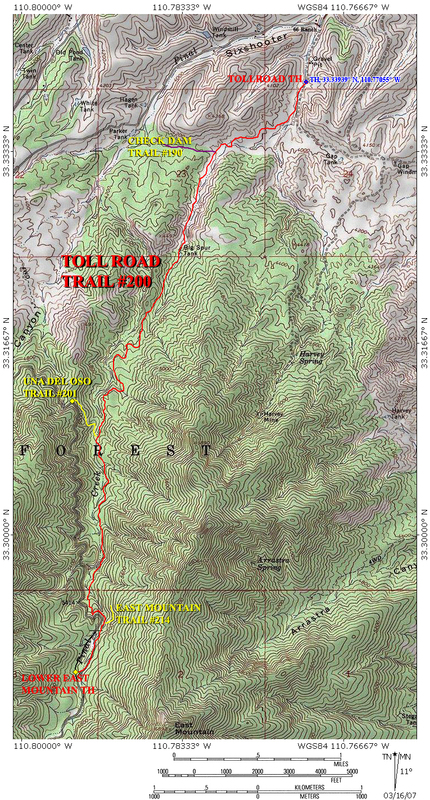 The Toll Road Trail #200 climbs the northern foothills of the Pinal Mountains south of Globe, Arizona. 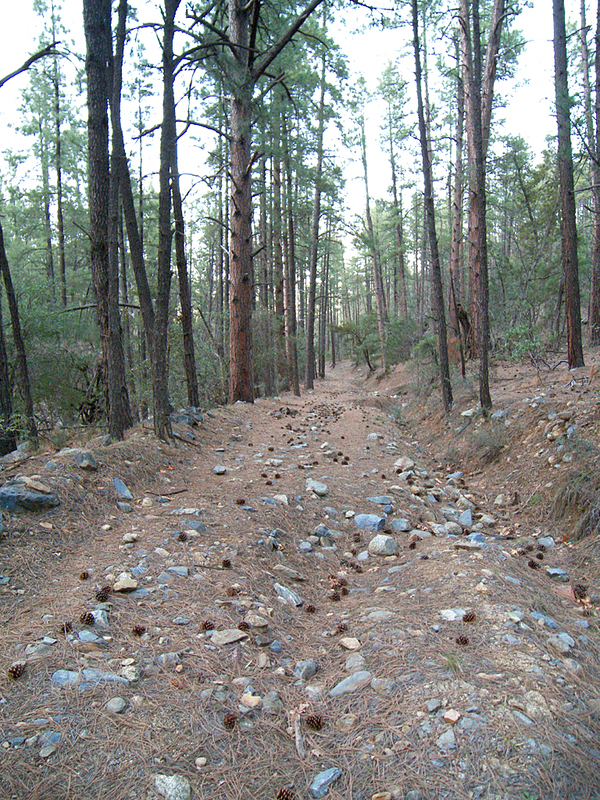 Starting in the high desert, this trail terminates in the tall pines of upper Pinal Creek canyon. The Toll Road Trail follows the route of an 1883 toll road that was built to provide access to the Pioneer Mining District on the south side of the Pinals. With three other trails connecting to it, the Toll Road Trail provides opportunities for loop hikes as well. Starting at the Toll Road Trailhead, begin heading south up the dry wash through the mesquites. The shotgun shells and litter will soon come to an end as the trail gets further away from forest road 138. The trail soon leaves the wash, passes through a gate, and enters a little valley at the foot of the Pinal Mountains. At 0.8 miles, the Toll Road Trail meets up with the Check Dam Trail (33.33329 N, 110.77994 W). Turn left to stay on the Toll Road Trail, and follow it south as it leaves the desert and enters a chaparral filled ravine. The trail's former status as a wagon road now becomes more apparent as it climbs up the brushy canyon. At 1.5 miles the trail arrives at a dry cattle pond known as Big Spur Tank. An old road goes uphill to the right, stay left. A pinyon pine, the first sign of forest to come, is encountered a short distance later. The Toll Road Trail exits the confines of the canyon and arrives in a little saddle around the 1.9 mile point. Now on a ridge, the trail offers up some great views of the velvety green Pinals, Globe and the distant Sierra Anchas as it continues south. East Mountain and Pinal Peak tower 2200 and 3200 feet above you, respectively. You will encounter the first ponderosa at 2.6 miles and pass through a wire gate at 2.8 miles, as you approach Pinal Creek. 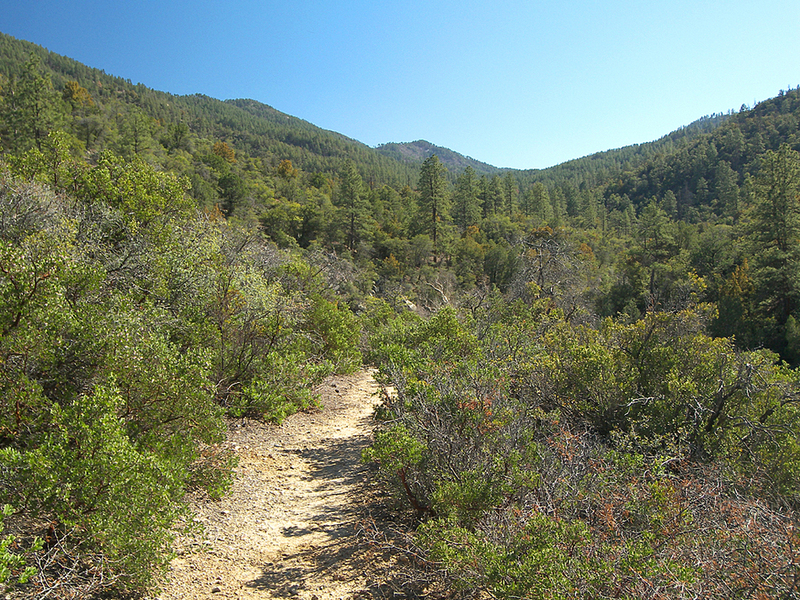 The trail now drops into the bed of sycamore lined Pinal Creek and enters a pleasant ponderosa pine forest. The Toll Road Trail meets up with the Una Del Oso Trail #201 at 3.0 miles (33.30841 N, 110.79222 W), before beginning a steady, mile long climb up slopes of pale grey granite on Pinal Creek's eastern bank. Around mile 4 the trail crosses over to the west bank of Pinal Creek to loop around a little hillside, before crossing back to the east bank again. At 4.4 miles you will arrive at the junction with the East Mountain Trail #214 (33.29234 N, 110.79159 W). The last one third of a mile to the Lower East Mountain Trailhead follows the old alignment of forest road 112, underneath a canopy of large ponderosas. The Toll Road Trail comes to an end where it meets forest road 112 on the west bank of Pinal Creek, after a 4.75 mile journey from the desert below. TOLLROAD TRAILHEAD (NORTH END): (33.33939 N, 110.77055 W) From the highway 60/highway 188 junction in Globe, head east on highway 60 for 2.9 miles. Turn left onto Broad Street at the stoplight. Follow Broad Street for 1.1 miles, then turn right at the fork, where you will immediately cross railroad tracks and a bridge (this now becomes Six-Shooter Road). Follow Six-Shooter Road for 3.65 miles, at which point it becomes forest road 138 (keep going straight). Follow forest road 138 for 0.35 miles to the brown Trail #200 signpost on your right (5.1 miles total from highway 60). The Toll Road Trail begins here at the small parking area. LOWER EAST MOUNTAIN TRAILHEAD (SOUTH END): (33.28802 N, 110.79455 W) From the highway 60/highway 188 junction in Globe, head east on hwy 60 for 2.9 miles. Turn left onto Broad Street at the stoplight. Follow Broad Street for 1.1 miles, then turn right at the fork, where you will immediately cross railroad tracks and a bridge (this becomes Six-Shooter Road). Follow Sixshooter Road for 0.9 miles, then turn right onto Icehouse Canyon road. After 1.75 miles on Icehouse Canyon Road, Kellner Canyon Road splits to the right. Stay left, and follow the road another 6.75 miles to the square, brown and white trailhead sign (the site of Lower East Mountain Trailhead, 8.5 miles from Sixshooter Road).